Weissbort often returns to Chardin in his still life paintings, as here. Chardin could elevate the humblest everyday object to an image resonant with depth and symbolism, at the same time producing a balanced and satisfying composition, beautifully lit and built of subtle and restrained colour harmonies. This particular work by Weissbort has much in common with two of Chardin’s: Still life with a rib of beef (Oberlin Museum), and Still life with kitchen utensils. 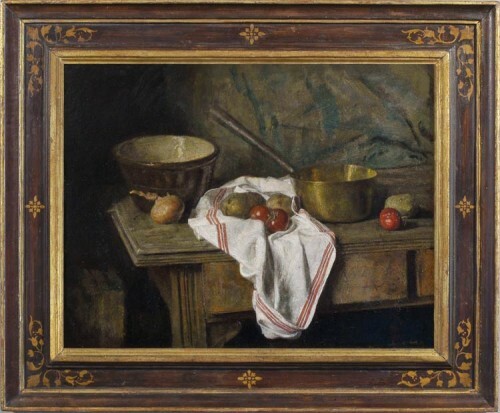 He uses similar motifs – the brass pan, the earthenware bowl, the linen towel, the wooden table, lifting the earthy tones, as Chardin does, with small amounts of red or green. Remaking an image in this way reveals the roots of modern art, in the Renaissance and with the masters of the 17th and 18th centuries, and gives an added layer of meaning to the work of art.